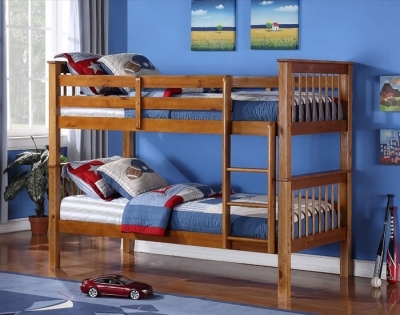 The Time Living Devon solid pine children's bunk bed is made with high quality New Zealand pine, then stained for a beautiful antique finish. This flexible piece of furniture can be separated to make 2 single beds and requires 2 UK single mattresses. Additional features include slatted shaker style foot boards and headboards, high side railings around the top bed for added safety and a ladder for easy access to the top bunk. Two standard UK single mattresses will be required with a maximum height of 6 inches for safety.